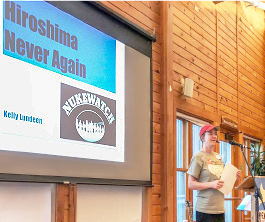 Nukewatch co-director Kelly Lundeen presented the keynote at the Hiroshima-Nagasaki commemoration in Milwaukee August 10. Nukewatch has been around since the last anti- nuclear movement and survived the chill after the Cold War. Right now the world is in a renewed anti-nuclear movement. I’m sure you’ve heard about International Campaign to Abolish Nuclear Weapons (ICAN) who received the Nobel Peace Prize for their work to ban nuclear weapons through the United Nations last year. Nukewatch is working to bring this movement back to the United States. Trump is helping us. A movement against nukes is necessary because we cannot stand for another Hiroshima and too many people have forgotten what that means. We are just lucky that Hiroshima, Nagasaki and the atomic bomb tests were the only times bombs were dropped on humans. It is really something I can’t even fathom. I don’t know how someone could have ever conceived of doing this in the first place. To lose 140,000 lives in Hiroshima in one instant? And 90,000 more in Nagasaki? How could anyone ever have done this? And how can we continue to develop and research new nuclear weapons? It’s total insanity. I want to give you an idea of what a Hiroshima-size bomb would look like here in Milwaukee. That’s highly unlikely, but this helps us understand what happened. Milwaukee is a city with a population of 600,000. In the immediate 1.7 square miles there would be an estimated 50,000 fatalities. Unfortunately, the bomb that was dropped on Hiroshima was very small compared to today’s weapons. Bombs of Hiroshima size no longer exist in the US arsenal. The smallest warheads are the W80-4s and they are 16 times more powerful than the one dropped on Hiroshima. The ironic thing is that the W80s are considered “low yield,” which has some legislators concerned that they might actually get used, as opposed to the big ones which are considered off-limits by most. These W80s are part of what we thought was going to be a $1 trillion budget to upgrade the nuclear weapons arsenal. It is actually going to be $1.7 trillion. This isn’t coming from Trump. This is nothing new. Every single president since these weapons were created has threatened to use them. At the height of the Cold war we had around 61,000 nuclear warheads and now we’re down to about 7,000. We need to acknowledge that this is a success. Our nuclear arsenal has three parts. There are land-based missiles, launched out of silos buried underground, sea-based missiles launched off submarines, and air-based bombs and missiles fired from planes. During the Cold War, the US had 1,000 Minuteman land-based missiles or inter-continental ballistic missiles (ICBMs) and now we are down to 450. Nukewatch has a book on the ICBMs originally published in 1988. Our volunteers went out and visited every single missile silo, made maps of them and published it so people could protest. In 2015, since the drawdown of weapons, we revised the book. With the current state of the US arsenal, nobody can take us seriously when we say it is for deterrence. If it were truly for deterrence we would have 100 or 200 warheads and they wouldn’t be designed as first strike weapons to be used in surprise, unprovoked attacks on other countries’ air bases and nuclear weapons — the opposite of deterrence. Unfortunately ex-president Obama authorized the $1.7 trillion nuclear weapons rebuild. The full $1.7 trillion proposal may not receive Congressional approval. A mistake of around a half-a-trillion dollars was brought to light by former Department of Energy advisor Robert Alvarez, who pointed out the cost of environmental restoration and waste management inside the nuclear weapons complex. When you break it down, that is $7 million per hour for every hour from 2017 to 2046. What does that mean for Milwaukee? In 2017, the taxpayers of the city spent about $80,000 on nuclear weapons. That’s $132 per person. I’m sure those who live here could think of better ways to spend that money. Spending $7 million per hour on nuclear weapons means stealing from every homeless person that does not have a bed. It means $7 million that does not help schools struggling to meet Adequate Yearly Progress. It means $7 million that is being taken from every one of us who need real health care. The CEOs at the top of the military industrial complex are part of the “1 percent.” We cannot afford to subsidize them anymore. The military budget is part of a transfer of wealth from the poor to the rich. The three wealthiest people in the United States have the same amount of wealth as the bottom 50 per cent. There are way more of us than them. If we are the 99 percent, then there are 99 of us for every one of them. So what can we do? We can resist! We need to do the things that we are good at to make the world better in our homes, in our communities, in our cities, or whatever scale we choose to work on. We can follow the example of the Kings Bay Plowshares. They snuck into the Kings Bay Naval Base in St. Mary’s, Georgia on the anniversary of Dr. Martin Luther King Jr.’s assassination, April 4. The Kings Bay Naval Base is the largest nuclear submarine base in the world. It is home to six ballistic missile subs and two guided missile subs based there. For breaking into the base, pouring their own blood in order to raise awareness about the horrors of nuclear weapons, each one of these activists could be facing many years in prison. Currently Nukewatch is involved in similar direct action in Germany. In the past month my colleague John LaForge,and dozens of others in solidarity with a German campaign to have the bombs removed, has cut through fences to enter the German air base which is home to 20 US nuclear bombs. They hope to fight the issue in court. Do we need more actions like this? Yes! But we also need more people to make independent media, raise food in a way that will nourish our bodies and our world, teach our children the truth. We should value the part we are playing. Then we need to break out of our comfort zones and do more of the things in solidarity with other struggles. If we are people with privilege we need to support struggles of people of color and the poor and recognize the impacts that they have lived with. In the case of the nuclear industry it is easy to see that the people on the frontlines are the people of North and South Korea, Japan, Russia or anyone who has ever been the target of a nuclear weapon. While the nuclear bomb is the most horrific thing humankind has ever created, it is part of the nuclear industry that comes as a package deal. The entire nuclear industry needs to be stopped, because we will always be facing all the same dangers that come with the entire nuclear fuel and weapons cycle, which is riddled with radiation and death from uranium mining, to nuclear power and weapons testing, to transport and storage of radioactive waste. You may be surprised to hear that way more people died from nuclear weapons testing (as many as 695,000 deaths from 1951-1973) than in Hiroshima and Nagasaki. McClatchy Newspapers reported in 2015 that at least 33,000 workers in the nuclear weapons industry died of cancers caused by workplace radiation. Native people all over the world have been disproportionately affected by uranium mining — in Niger, Australia, Canada and the US. Indigenous people in the southwest US are the survivors of uranium mining radiation, nuclear weapons tests, milling, and radioactive transportation. I’m out here at the NRC public scoping meeting to stand and speak out against the proposed nuclear waste site. I’ve been involved in a lot of issues around uranium mining, nuclear colonialism and the legacy of New Mexico as a nuclear sacrifice for the United States. I oppose this very strongly. It is a really terrible and awful idea. It will have a lasting impact that we should not have to face in addition to all the other issues we face in nuclear New Mexico. I’m also here representing the Red Nation. The Red Nation is an organization that is very strongly opposed to anything to do with nuclear from the mining, the milling, and the processing, to the creation of the bombs, and to using land for nuclear waste storage. The United States and the people on this continent should be thinking about how to shut down and deactivate all the nuclear facilities so that we don’t create the need for anymore storage. Obviously we are going to have to think about a way in which all of the waste gets stored properly. We are already dealing with that legacy: the legacy of contamination from the mines, the legacy of the contamination from Los Alamos and other areas. What a lot of us don’t understand is why we have to create new issues to have to deal with new waste. We shouldn’t have to be dealing with this. The only reason why they’re dumping it on New Mexico is that we are a poor state. They know that we are desperate for cleanup jobs, waste jobs. They know that no one cares, that it’s a politically safe move to dump it on the poor people of New Mexico. So just say no to nuclear waste. The work that is being done to oppose the centralized radioactive waste dump in New Mexico is also helping us. If one of these dumps opens and radioactive waste begins to be transported, waste from two closed nuclear reactors in Wisconsin will be transported through Milwaukee by train. A single train car of this radioactive waste would carry as much plutonium as the bomb dropped on Nagasaki. This is why Milwaukee is more likely to be hit with a radioactive waste transportation accident than by any enemy attack. Right now there are some specific actions we can take related to the nuclear industry to take part in the growing anti-nuclear movement to make sure Hiroshima never happens again. Legislatively, there are a few proposals that you can urge representatives to support. Yes!—H.R.669 is the Restricting First Use of Nuclear Weapons Act of 2017. It is not perfect, but it is a step in the right direction to prevent the US from dropping a first strike nuclear weapon without a Declaration of War by Congress. No!—H.R. 3053 is a bill that would authorize the New Mexico dump Micheáilín opposes and revive the option for Yucca Mountain, which is not an option. Yes we need a safe place to store this dangerous waste, but Yucca Mountain is not it. It is not even on our land. It was never ceded by the Western Shoshone people. No! – All the separate parts of the $1.7 trillion nuclear weapons rebuild need to be opposed. Outside of lobbying work, we need to be in the streets opposing war and the bomb. Campaigns like Don’t Bank on the Bomb and Nuclear Weapons Ban Treaty Compliance are moving forward. If radioactive waste begins to be transported we might need people out to stop the trains or out watching for radioactive transport vehicles. So I hope to see you in the streets!